Athletes are always striving to be the best. There are lots of great coaches out there with different approaches. A few months back I had a trainer, Travis Hansen, approach me to see if I might be interested in reviewing his speed product. These types of requests are commonplace in the industry, and I have several requests to review and endorse products. While I am generally hesitant to promote other products, I am always looking to expand my current knowledge base and learn something new. 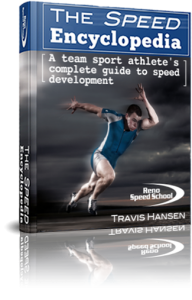 I was naturally very skeptical when asked to recommend this product, but I can honestly say that after reading this book that it is a great product for any coach or trainer, or even athlete looking to learn the ins and outs of speed development. 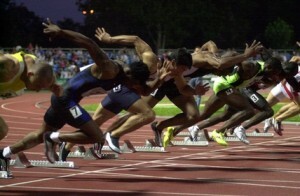 It takes all the different elements of speed development and condenses them into manageable chunks of content. Sometimes I nerd out and will read a 300 page book just on special strength training. Sometimes that’s just too much. But, if you’re having a thought or working through an idea, it’s probably covered here and it’ll give you some insight to answer your question or send you to a more detailed resource or direction. I really like that Travis isn’t trying to push some already established format of training on you and the call it a cute name and say that he invented it. Some of the concepts you may actually know really well. Others you’re probably aware of, but have only a passing knowledge of. Regardless, it’s all in there. It’s like a central hub for training topics. “Oh man, how does Post Activation Potentiation work again?” Just go to the book and get a Cliff’s Notes sized version on the topic. Maybe it scratches your itch or maybe it sends you off somewhere else for a deeper look. With so much training info in my library, sometimes I’m just looking for confirmation of my own thoughts, not a research project. If the book talks about a topic, Travis cites the original author/creator. He’s not saying this is all coming from his brain, he’s just done a lot of research and clearly cites whose idea it was originally. Many of us who put out information have been bashed by people in the industry who took credit for other peoples’ information or ideas. Whether or not you believe anyone who sells any information can actually take credit for inventing it (since everyone’s coaching philosophy is just a personalized interpretation/presentation of other peoples’ information) this book won’t offend. And since it cites all its material, you can be confident it wasn’t pulled out of the others. All in all, it is a very solid product. It’s only $37 right now. Considering I rarely promote other peoples’ stuff, I feel confident in telling you it is $37 well spent. I thought a fitting way to kick off the new year would be to share the top 10 things I learned or embraced that have most shpaed and impacted my training and rehab this past year. In no particular order I will rattle these things off. I hope at least one of these little pearls has a positive impact on your training and/or rehab as well. Often times it appears necessary to perform a biceps tenodesis or tenotomy in active adults undergoing a SLAP repair to ensure more predictable pain relief. I heard this at a sports medicine conference last May and I can tell you those patients having this done alongside their shoulder surgeries seem to recover quicker with less pain relief. With that said, keep in mind that SLAP tears are difficult to define and operate on as surgeons still do not have great agreement across the board on defining the extent of injuries and how to deal with them (operative vs. non-operative). Performance on the Functional Movement Screen (FMS) has little to no correlation with athletic performance. I screened an NBA player and an NFL player this year who both failed the screen. However, they obviously have mad athleticism and genetic ability. Keep in mind the FMS is a valuable tool used to assess movement and expose injury risk patterns based on the 7 tests. Soft tissue therapy is undervalued and misunderstood by most lay people. Assessing tissue restrictions and educating our clients to perform self myofascial release techniques is essential if they want to compete and remain healthy day in and day out. Specific problem areas I have increased my focus on this year have been the psoas, soleus and posterior rotator cuff/joint capsule. Click here for my soleus blog post. Core training is probably as much about not moving as it is about generating force with movement. I read work from Stuart McGill and other smart people in the field, and the concepts of anti-rotation and anti-extension are sound concepts to explore and look more closely at. Many times, performance in sport and life require us to resist movement and maintain position so strengthening the core to resist potentially harmful and stressful motions is and should be an important part of training and rehab programs. Understanding how to facilitate and activate core musculature in the training to protect the spine and improve mobility/strength is key. Click here for more on my core training. Hip dissociation is an important element to train as the lack of it can impact function and performance in a negative way. We assess it on the active SLR in FMS and I see the lack of it show up on clinical exams all the time. Whether it is HS tightness, hip flexor weakness or simply poor neuromuscular control, clients who are unable to effectively dissociate the hips are more prone to injury and limited performance.